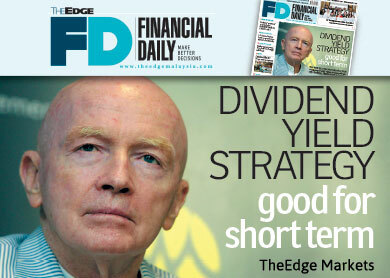 KUALA LUMPUR: Investing in stocks that pay good dividends is the best strategy for investors in the short term as the FBM KLCI is overvalued in price-earnings ratio (PER) terms compared with other Asian indices, said Templeton Emerging Markets group executive chairman Dr Mark Mobius. Yesterday, the KLCI closed at 1,803.14 points, with a PER of 16.38 times. On the other hand, Singapore’s Straits Times Index ended the day with a PER of 13.27 times while the Hang Seng Index closed with a PER of 10.05 times. “It’s not a good idea to make short-term decisions in the market. Look at individual stocks in Malaysia to determine what the growth rates are going to be and what the valuations are now. At this stage, there are a number of stocks that you can buy, but I wouldn’t rush in. “You have to look for cheaper stocks, those that have good growth but a relatively low PER and [good] yields. At this stage there are a number of very attractive high-yielding stocks, where the yields range from 5% to 7%,” Mobius told reporters after a luncheon talk yesterday. He said stocks such as British American Tobacco (M) Bhd, Guinness Anchor Bhd, Carlsberg Brewery (M) Bhd and banking stocks are of particular interest, as those traditionally reward shareholders well. “I’m very interested in banks, in particular. Because they reflect the growth of the country they are in. They [are] more diversified and less volatile as a result, and you get a nice dividend yield,” Mobius said. He is also interested in the pharmaceutical and medical care industries as they are “high-growth industries”, while he considers the property sector in Malaysia as one of the best markets for foreign investment. “Property companies here look quite interesting, particularly those that are in a diversified portfolio,” Mobius said. In his presentation earlier, Mobius said while property prices in Malaysia are rising, the number of non-performing loans and mortgages is declining, demonstrating the buying ability of Malaysians compared with other countries in the region. “Thailand, Indonesia and [the] Philippines have a higher rate of non-performing loans. So from that point of view, it’s (Malaysian property) clearly affordable and if you look at house prices in relation to income, Malaysia is right there at the bottom,” he said. On Malaysia as an investment destination, Mobius said tax rates for investors and predictability are the determining factors for foreign direct investments (FDIs). “One of the things that hurt Malaysia a lot during the Asian financial crisis was when it stopped money going out. That created a lot of angst among foreign investors. It is very important to create a sense of confidence that there will be some predictability in the rule of law,” he said. However, Mobius said factors like the undervalued ringgit, high-yielding stocks, the government’s programme to open up the market and efforts to integrate with other Asean markets also contribute to attracting FDIs. On how the KLCI would end the year, he said the index should close higher — barring major crises — but did not specify a target. “The trend is definitely moving upwards despite the valuations because there is room to accommodate high PER since the interest rates are so low,” he added.